Trunk to 1m in dia. fibrous at base with roughened frond bases on upper half. Locally abundant in moderate to high rainfall areas in the north and east of the State. Sparsely scattered on the west coast. Has a higher light requirement than Dicksonia antarctica. 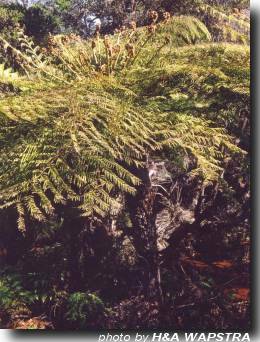 The two species frequently grow together but C. australia usually occurs on higher, drier slopes. Tolerates boggy soils. For further details of propagating from spores see C. cunninghamii. Readily re-establishes from spores in regenerating logged sites and in other disturbed but sheltered, moist clayey soils, receiving ample light. Very adaptable, tolerating a range of conditions from wet soils to dry situations. Will withstand more sun than most species. Immature fronds may be burnt by frost, but are quickly replaced by new fronds in spring. Not suitable below powerlines.